Winning the 43rd edition of the Memorial Tournament presented by Nationwide was special to Bryson DeChambeau for a number of reasons. It was his second PGA TOUR title in as many years. It came in one of the elite events on TOUR hosted by legend Jack Nicklaus. It was populated by one of the year’s strongest fields. 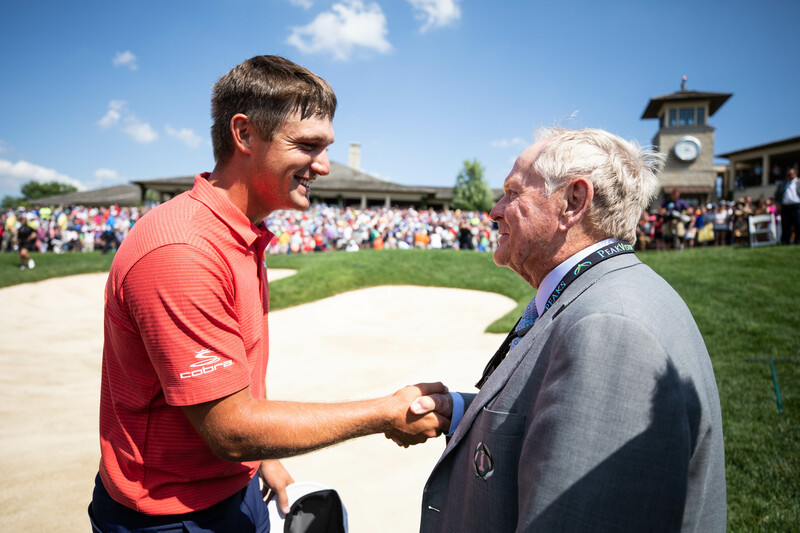 And DeChambeau had to earn it, overcoming a bogey on the 72nd hole to fall into a playoff, but then outplaying Kyle Stanley and Byeong Hun An in sudden death to earn a handshake from the Golden Bear, not to mention $1.602 million. DeChambeau didn’t have close to his A-game on June 3 for the final round of the Memorial, but his short game and putting were good enough until he beat An on the second playoff hole with a 12-foot birdie putt on the same 18th green where he had three-putted at the end of regulation. After missing the 18th green his first two tries on Sunday - the first costing him a bogey that dropped him into a playoff with An and Kyle Stanley - DeChambeau got it right the third time, drawing an 8-iron to 12 feet above the hole and sinking the decisive birdie putt for his second PGA Tour title. DeChambeau, the 54-hole leader, carded a final-round 71 at Muirfield Village Golf Club to finish at 15-under 273 before winning the first three-way playoff in Memorial history and the fourth playoff in the last five years. Stanley, the second round co-leader, had a 70 while An shot 69. The win propelled DeChambeau to fourth in the FedEx Cup standings and eighth in the U.S. Ryder Cup standings, a goal that tops all others for the second-year tour member. But the real prize for golf’s deepest thinker is backing up last year’s victory in the John Deere Classic with another win, one that came with Tournament Founder and Host Jack Nicklaus looking on and against a field that included eight of the top 10 in the world rankings and five-time Memorial winner Tiger Woods. And not even with his best stuff. He saved par from off the green 17 of 21 times, thanks mostly to leading the field in strokes gained-putting. “I kind of grinded it out,” he said. The win came one year after DeChambeau didn’t even make the field at Muirfield Village because of a deepening slump. He was in the midst of missing eight cuts in a row and 13 in his first 17 starts of the year, a string that ended with a poor U.S. Open performance. The Memorial title was bigger, however, primarily because of the quality of the golf course and the strength of the field. Not only did eight of the top 10 in the world compete, but six of them finished in the top 15, while Woods, who was lurking all weekend thanks to great ball-striking, ended up tied for 23rd. DeChambeau had to fight off a decorated bunch. He played well enough. He found a way.